Today I want to share with you some helpful information about one great tool which I use for almost 20 months. It’s Market Samurai. This tool should be used by every Online Marketer and SEO specialist. It helped me in SEO and my online work even more than Triberr helped me in my adventure with social networks. Let’s find out some more details about each feature. First of all – you should create a new project. It’s very simple – type your main keyword, title of your project, file name and language, click “Create” and it’s done. Now you should go to “Keyword research” area. For best results you should connect Market Samurai with your Google AdWords account. Specify needed length of phrases, type some keywords into “Add Keywords” area, click “Add keywords” button and Generate Keywords. 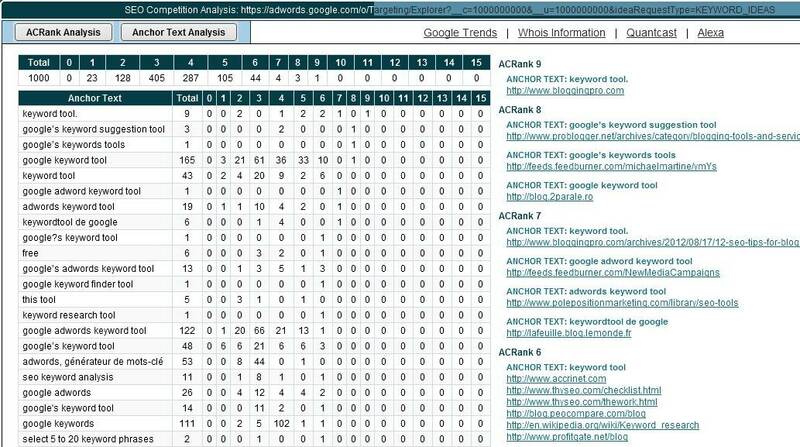 In the example below MS generated 737 keywords for me. In keyword research area you should mark (tick) interesting fields (organic, adwords, competition, commerciality), change match type and period, and click analyze Keywords. Of course you can choose other setting – it depends on you. And of course you can order your keywords as you want. Now it’s time to find proper domain name for your site. 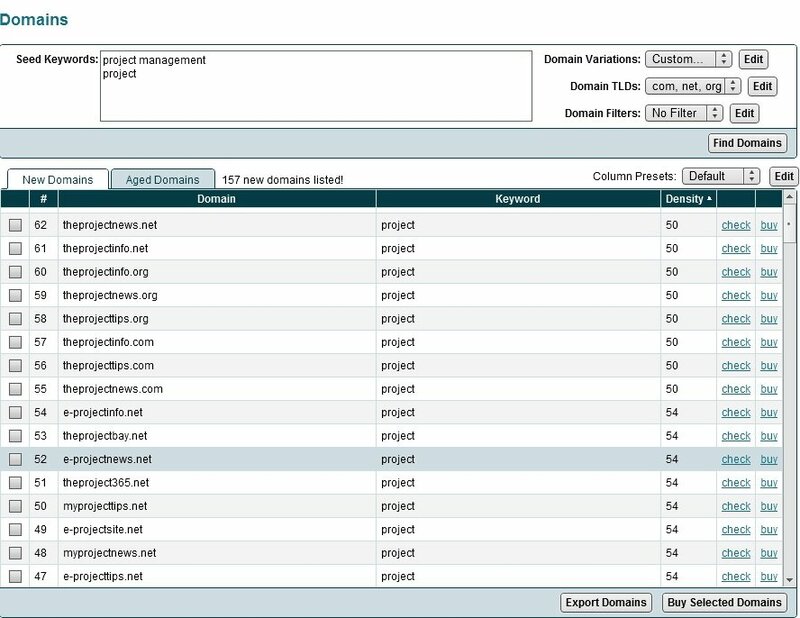 In “Domains” tab you should type some of your keywords. I find a lot of my domains (org, net, biz and com) with that tool. For example this blog (NoPassiveIncome.com) and ProjectManagementBay.com (it’s not ready yet 🙁 ). At this moment you can search only for new domain names. Now you can check how strong your competition is. For chosen keyword (in SEO Competition button area) you can find top 10 pages (you can add your own URL too – chose “Add custom URL”). The last 2 options are the most important here (because they show backlinks in details) and are from Majestic SEO (you don’t need to pay for it additionally!). With Market Samurai you can monitor for free 10 of your keywords (White belt plan). 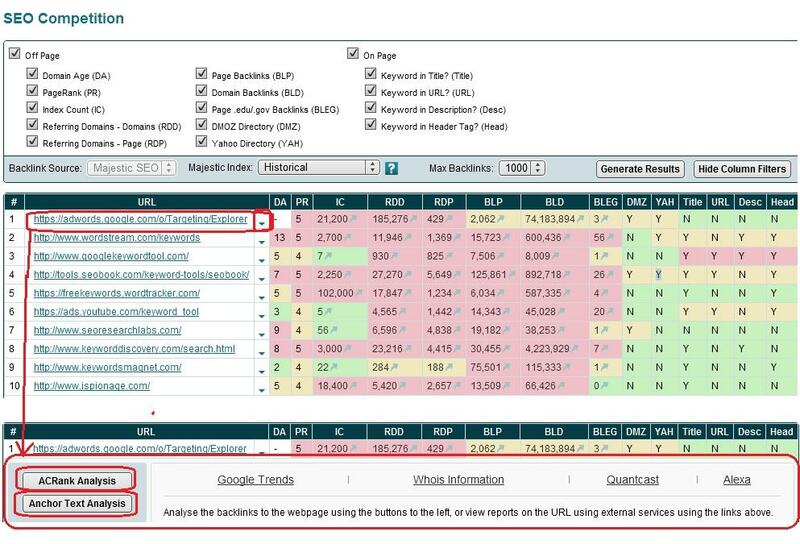 If you want to monitor more keywords, you must pay for it additionally. I started to monitor with this tool some of my phrases recently, and it seems that it works properly. In “Keyword Research” area you can find estimation, how much you will pay (as an Adwords advertiser) if your keyword will be on the #1 of SERPs. I don’t focus on it, but for some marketers it can be an additional feature. Honestly I’m not using it. But if you want, you can find products in ClickBank, Amazon, Commision Junction and PayDotCom affiliate programs. If you still don’t know, how to use this tool, below this link you can find more Market Samurai tutorials. Has This Tool Only Advantages? No. Market Samurai has one disadvantage – it’s not very fast tool. For me it works very well even with that speed. But if you want very fast tool – please try to find something else for you. How Much Market Samurai Costs? It’s not cheap tool. Normally it costs 149$. But using this link, you can download your free trial version and test it for 12 days since registration. There is no difference between free trial and paid version – so you can try each function. Can I Get This Tool Cheaper? Yes, you can. You should only download your free version of Market Samurai. After registration you will get an email with registration details. In this email there will be your unique link to download your free version, registration key and link to great offer – you can get Market Samurai for only 97$. But remember – since registration you have only 7 days for getting your Market Samurai for this promotional price of 97$ (instead of 149$ – it’s 35% discount). When I started using it at the end of 2010, I was able to install it on 2 computers at the same time. Yesterday I contacted with Market Samurai support – now you can install it (with one license!) on 5 computers which is enough even for a small business! And what about you? What tool are you using for your online marketing? Do you use Market Samurai? If not, you can try it for free here (my affiliate link). If yes, please share your experience with us in comments below. I have heard alot about Market Samurai and to be real, from what you’ve shown there seems to be a whole bunch of controls.. looks like I need a pilot’s license just to use it! Hi Caleb, yes, it’s very useful tool and you can try it totally for free. This is awesome. Everything I need all in one place. I normally have to get all of this info from 3 – 4 different sites. Great that you like it. Thanks for stopping by. Great post..lots of useful info. Its really an amazing tool bro….. It is itself a SEO specialist……I’ll try it and will buy it soon. Hi Sandeep, it’s really great tool. I know that it’s not cheap, but you can try it for some days for free. Please let me know what are your experiences with this tool. This is really a great tool which I’ve been using from last 8 months. 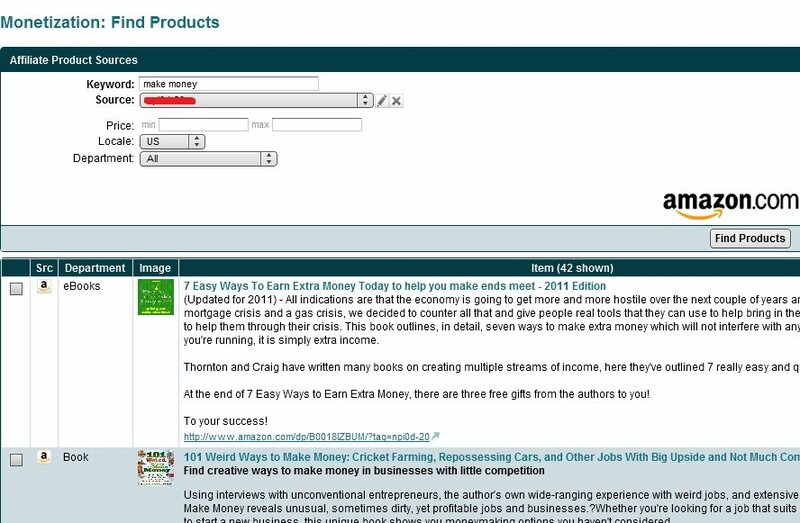 I also didn’t use It’s finding affiliate marketing products feature yet like you. nice to hear that you are using it! I must agree with the post and really feels that these tools are great. This is definitely going to be a great help for all the Seo Specialists. I like the keyword research tool. It’s simply great. Thanks for the share!! Heard about this tool before but didn`t got a chance to see how to use it. Thanks Chris for your post which made me easy to know about Market samurai. I have used Market Samurai for a while too and I can assure you, It is the best thing to happen to keyword research. My only grievance is the speed issue, but it does what it is meant to do – which to me is show you how to win the keyword wars in any niche. I’m still researching on the best keyword tool to grab. A lot is being said about market samurai. It looks like one of the best and most affordable in the market today. Great review though and it’s a great product. I’ll definitely say that for sure. I totally understand you – if you have another tool, probably you don’t need this one. 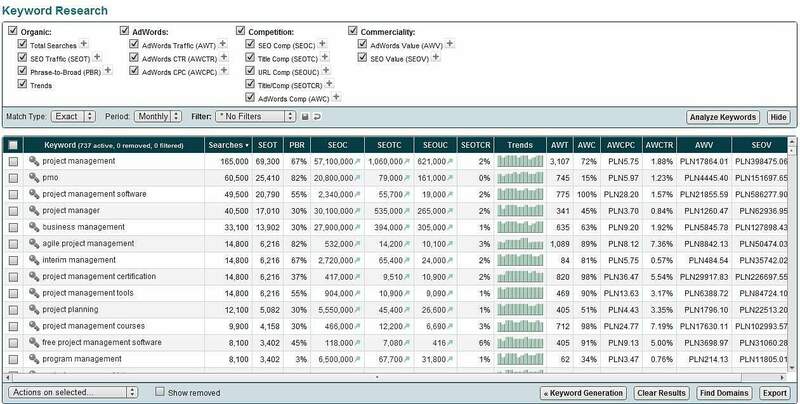 May I ask you which tool do you use (especially for keyword research and analysing competition)? Thanks for the review of Market Samurai, but I have to say that I don’t think you can really recommend this tool anymore, not after the changes that they’ve made. There are a few things that I see that are wrong with it. I’d like to humbly suggest you check out another tool called serpIQ, which does what Market Samurai does but is faster, online (use anywhere), and gives you some actionable information as well. You’ve got some valid points there. serpIQ can get pricey if you’re not doing client work that’s bringing in some steady reliable income. We actually just launched v2.0 of the product and are targeting more consultant/agency SEOs. Thanks for the review. I’ll consider using Market Samurai for my next project. Hi Anup, you are welcome! Yes, MS is a great tool. Been using it since it’s prelaunch and really one of the best purchases I have ever made. Also, the SeoMoz Pro account is one purchase I have made which was great too. So much you can do as an IM or SEO :). I did make a guest post on basicblogtips.com (on MS) awhile back. I’ve been introduced to this tool by a friend nearly a year ago and it performed more than expected. This is a must have tool for every blogger who takes online marketing seriously and it is one of the tools you will not regret purchasing. Seeing the features mentioned by you this tool seems to be very useful but as I am a newbie blogger, dont wanna shell out much for blog. Let me make some bucks and then will surly invest. Bookmarked your blog to buy it only through your link.